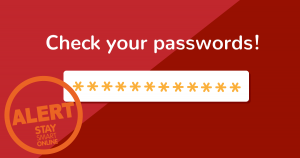 You are advised to check you have strong and different passwords for all of your online accounts, following continued reporting that billions of people have had their logins and weak passwords exposed online. The database reveals peoples’ usernames and passwords for a number of different social media and other online accounts. If your credentials (usernames and passwords) become publicly available, a criminal could use the information to login to your online accounts. Originally published at Stay Smart Online and reproduced here under the Creative Commons Attribution 4.0 International Licence.